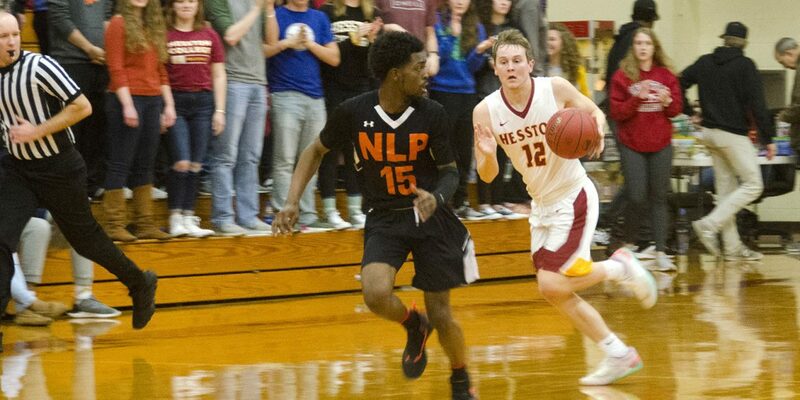 It was the first day of spring term classes and basketball tipped off again in Yost Center as Hesston College took on Next Level Prep Academy (NLP) out of Wichita, Kan. It was an emotional night that saw the Larks band together and rise in character and determination to defeat Next Level 89-86. The introduction of ‘The Nest,’ the new Larks student section and its embodiment from the students added passion and fueled the excitement for the late comeback charge that sealed the victory for Hesston. It was a back and forth game in the opening minutes. These five minutes saw the game tied 3 times and two lead changes as Hesston and Next Level exchanged shots. With the score tied at 9, NLP went on a 15-4 run over the next 4 minutes leaving the Larks trailing 26-13 at the midway point in the half. The Larks fought to get back in the game, but Next Level’s athleticism would not let that happen. They matched their largest lead – 13 – with 50 seconds left in the half. Sterling Hicks hit a 3 followed by a defensive rebound by Cal Hartley that led to a quick bucket on the other end. A Next Level free throw with 7.8 seconds on the clock gave NLP a 44-34 lead. That is when the momentum changed and the quality Lark character started to emerge. Two technical fouls were issued to NLP as the Larks brought the ball up the court. Hartley hit 3-4 of the free throws and as time expired, nailed a straight-away 3-pointer from deep to bring the Larks within 4 at the half. The second half saw more of Next Level’s athletic quality and they stretched the lead to 11 at different points in the half. They opened up the lead to 13, 81-68 with just 6 minutes remaining. But that is when the Larks resolve and determination took hold. After a Hesston College timeout, the Larks defense became oppressive, leading to an open break dunk by Grant Harding. The comeback was on. The Larks only gave up two more buckets in the game and went on a 17-3 run to close out the contest. With just 5 seconds on the clock, Hartley finished up his incredible night by sinking 2 free throws and icing the game. Eleven Larks played but it was the starters who really shined. Hartley led the team with 23 points, Hicks had 20, Harding 17, Danny Bradley Jr. 12 and Braden Handcock 11. The Larks will be back in action tomorrow night, January 18, as they take on Bethel College JV in Yost Center at 8 p.m.